Food Hunter's Guide to Cuisine: Dark Chocolate Pistachio Chocolate Chip Cookies & A Giveaway! Dark Chocolate Pistachio Chocolate Chip Cookies & A Giveaway! May 15th is National Chocolate Chip Cookie Day and what better way to celebrate than with a recipe and a giveaway (see below for details). But let's be honest, most of us don't really need a reason to make chocolate chip cookies. If you love them as much as I do, everyday seems to be chocolate chip cookie day! One of the most versatile cookies around, chocolate chips can easily be changed up depending on what you have on hand. The key is to start with a good base recipe and to use quality ingredients. One ingredient that I never skimp on is vanilla. My favorite is the Nielsen-Massey brand Madagascar Pure Bourbon Vanilla and I try to always have it in my house. The sweet, creamy vanilla flavor makes even the basic cookie extra special. Switch the chips: Instead of using all semisweet chocolate chips, try using white chocolate chips, dark chocolate chips, or a combination of all three. Using coarsely chopped baking chocolate instead of chips will add a gourmet feel to the recipe. Build a sandwich: Pair your recipe with your favorite ice cream flavor for the perfect ice cream sandwich, or spread them with buttercream frosting for a cookie sandwich treat. Use a peanut butter frosting for that classic chocolate and peanut butter combination that everyone loves. Place rack in the upper third of the oven and preheat oven to 300 degrees F. Line baking sheets with parchment paper and set aside. In the bowl of an electric mixer fitted with a paddle attachment, beat butter and sugars together until pale and fluffy, about 4 minutes. Add the egg and beat for about 1 minute more. Add vanilla extract and beat to incorporate. In a medium bowl, whisk together flour, baking soda, and salt. Add the flour mixture to the butter mixture. Mix on low speed until just incorporated. Finally stir in the chocolate chips and nuts. Scoop cookie dough by the tablespoonful onto prepared baking sheets. Leave about 2 inches of room between each cookie. Bake cookies for 18 minutes, or until just golden brown. Remove from the oven and allow to cool on the pan for 5 minutes before removing to a wire rack to cool completely. I like them best with just chocolate chips and not to many of those. My favorite add-in are homemade candied orange peels - chopped! LOVE COOKIES!!!!!!!!!!!!!!!!!!!!!!!!!!!!!! I actually like other cookies better than choc chip BUT I had a great one with added in macadamia nuts & white choc chip & cranberries!!!!! I like walnuts in my chocolate chip cookies but have been experimenting quite a bit lately. I make up plain cookie dough and refrigerate it, taking out enough for a couple of cookies every night. One night it was dark chocolate with potato chips, another was S'mores (graham cracker, marshmallow and chocolate), and chocolate chip with bacon & maple caramelized pecans. About a month ago we had a family dinner with our parents and I decided to have a cookie party dessert afterwards. I premade the dough and divided it into balls. Each person got their own dough and I laid out about a dozen and a half different mix-ins. Everybody got to make their own creation. As the cookies baked, we chatted and then commenced with dunking! The "kids" loved it and when I say that it mean everybody! Disappointed that having a facebook account is a prerequisite to entering contest. 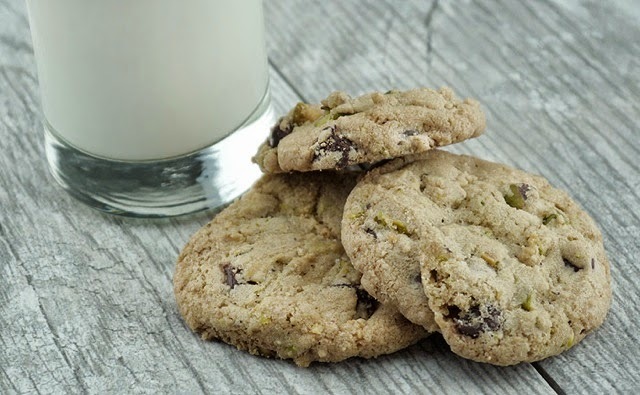 Chocolate chip cookies are one of my favorite cookies and adding pistachios was brilliant! I also like to make them with peppermint chips at Christmas. Thanks for sharing on Tasty Tuesday. I love 'em with walnuts or chopped brazil nuts. OH MY GOODNESS!!! Thank you SO much… today I was SERIOUSLY thinking of how much I wanted a Chocolate chip cookies but now I CAN HAVE SO MUCH MORE!!! i love adding walnuts or white chocolate chips to my cookies! Vanilla extract is a must! I am on a pistachio kick lately so I am loving that you have this recipe! Pinned! Thank you!